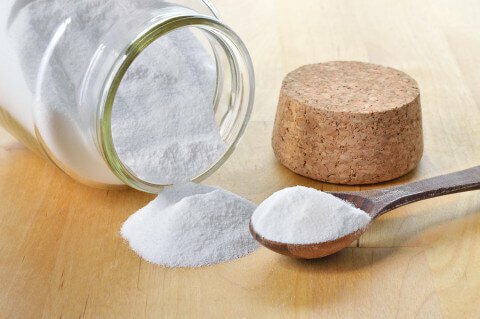 Baking soda has deodorizing properties. You can freshen up your whites by simply adding a cup of baking soda to the rinse cycle of your washing machine. Baking soda is great for removing tarnish from silver with warm water, and if you mix it with cold water, great for removing rust from steel. To avoid clogged drains, pour ¼ cup baking soda down weekly and rinse it with hot water. To quickly clean pets and remove “wet dog” smell, sprinkle your furry friend with baking soda and brush their fur. Children’s toys can be cleaned with baking soda (¼ cup baking soda and 1 quart warm water). Submerge the toys in this mixture and then rinse with clean water. Baking soda will keep garbage odours away, simply sprinkle of the bottom of the pail and sprinkle again after you put a new bag in. A box or small bowl of baking soda in the refrigerator, freezer, or any cupboard will keep away unpleasant odours. Hairbrushes and combs can be cleaned in a baking soda solution. Rarely, some people experience an allergic reaction to sodium bicarbonate, according to Drugs.com. Signs may include hives, itching, wheezing, difficulty breathing, coughing, chest tightness, throat closing, fever, facial or mouth swelling, skin turning blue and seizures. An allergic reaction to sodium bicarbonate should be considered a medical emergency.